Female monarch laying eggs on swamp milkweed leaf. The Monarch Monitoring Project field season lasts two months, running Sept. 1 through Oct. 31. We start up tomorrow morning, with the year's first census conducted at 9:00 am. The 10-month off-season officially ends tonight. Of course there are a few tasks that we undertake during the off-season. We make plans for new projects, such as the Monarch Ambassador trainings and the pilot studies we'll soon begin at Stone Harbor Point, East Point, and perhaps other locales. We get all of our project materials together and purchase needed supplies. We interview and hire the seasonal staff. We work on fundraising. It's all in preparation for the field season, so we're awfully excited when September 1 finally rolls around. The monarch butterflies aren't resting during the off-season, either. Four or five generations pass each year, so monarchs have been busy being monarchs -- being tiny eggs hatching after just a few days, being hungry caterpillars gobbling down masses of milkweed leaves, being jewel-like chrysalides as amazing transformations take place inside, and being adult monarch butterflies. Each of the spring and summer generations of adult monarchs have behaved the same way, dispersing around the continent, mating, and in the case of females, laying eggs on the leaves of milkweeds. I photographed the one shown here at Cape May Point State Park today as she laid eggs on the leaves of swamp milkweed plants along the park's Red Trail. 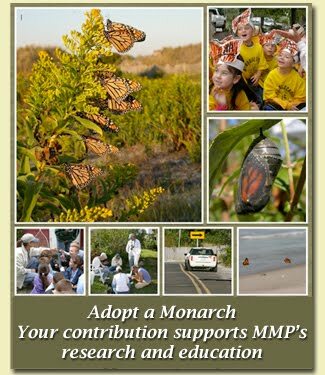 It's not hard to find monarchs around Cape May right now, but most are still not acting like migrants. Males are patrolling territories, especially around milkweed patches, in search of females. Females are laying eggs. Most of the monarchs we're seeing are somewhat faded and even a little tattered. This is the end of the year's last non-migratory generation. I saw two monarchs today that looked like they were on the move. At this season we alway have a mix of the last of the non-migrants and the first of the migrants. Right now it seems like we have more of the former than in many other years on August 31. Soon this will change and we'll start to see lots of migrants moving to, and through, Cape May. Whether the first big push of migrants comes in a day or a week or in two weeks, we'll be here watching and we'll be sure to let you know.